6:10 PM PT — Authorities say they found a suspicious package addressed to Rep. Maxine Waters in a Los Angeles mail facility. The ATF says the package is similar to others mailed to high-level politicians. It’s the second time today Maxine has been targeted … police previously intercepted another package addressed to Waters at a congressional mail facility in Maryland. 11:30 AM PT — President Trump and Melania Trump just addressed the bombs sent to the Clintons, Obamas and others … with Melania speaking first and condemning what she called “cowardly” attacks. Trump came to the podium next and issued an unequivocal denunciation over the bombs, saying … “Acts or threats of political violence of any kind have no place in the United States.” He got a standing O for his remark. 10:12 AM PT — NYPD and other authorities just held a news conference to discuss the device found at the Time Warner Center. Officials say a white powdery substance was also found in the package there. 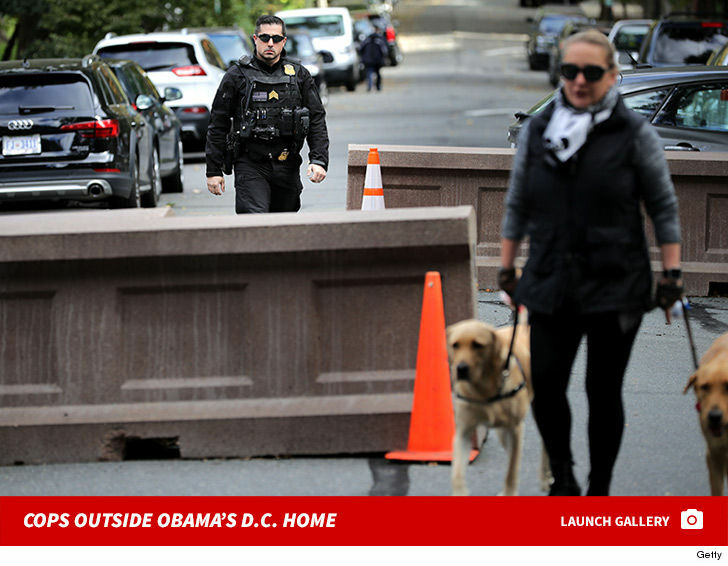 They say all of the devices — at CNN, the Obamas and the Clintons — appear to be pipe bombs. Governor Andrew Cuomo said a potential explosive device arrived at his office, and police took care of it. However, our law enforcement sources tell us the device turned out to be a harmless flash drive. A device was also sent to former Attorney General Eric Holder, who’s expected to run for Prez in 2020 … according to CNN. 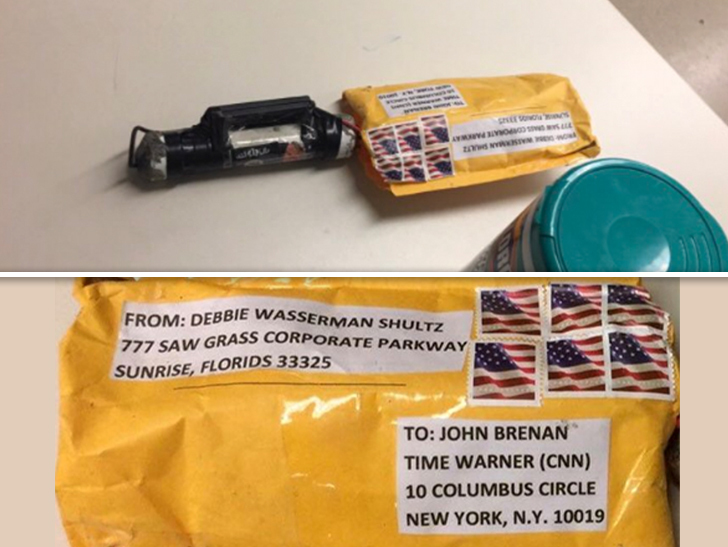 However, the package had the wrong address, and went back to Wasserman-Schultz’ return address. That appears to be the device that was found Wednesday morning at her Florida office. 8:55 AM PT — All the packages reportedly have the same return address, which belongs to Rep. Debbie Wasserman-Schultz. She was chairperson for the Democratic National Committee from 2011 to 2016. 8:40 AM PT — Democratic Congresswoman Debbie Wasserman Schultz‘s Florida office was just evacuated after a suspicious package was mailed there Wednesday morning. The bomb squad is currently on scene. 7:55 AM PT — Law enforcement sources tell TMZ the package sent to the CNN building was addressed to former CIA Director John Brennan, who has been a frequent CNN contributor. The package was a manila envelope with 6 stamps. 7:55 AM PT — It now appears the stories that a bomb was sent to The White House are incorrect. As far as we can tell right now, no such device was sent. That re-focuses the terrorist attacks and strongly indicates the targets were prominent Democrats who were highly critical of Donald Trump. 6:45 AM PT — Federal authorities tell TMZ, they believe the same perpetrator(s) sent the bombs to both Soros and the Clintons. A bomb was found near the home of Bill and Hillary Clinton … and we’ve just learned a suspicious package was sent to the home of former President Barack Obama. A technician who screens the mail for the Clintons found the device at a screening facility nearby their Westchester County estate in Chappaqua, NY. The device was discovered late Tuesday. Hillary was at a campaign event in Florida, but former Prez Clinton was at home.